All around the country, from Telemuca, CA to Dallas, TX GMs and amateurs gathered for labor day regional championships. With the ease of air-travel and so many super-sized chess extravaganzas, it's refreshing to see so many of our best playing for state honors. CLO brings you results and snapshots from New Jersey to Virginia and a longer dispatch from Chuck Ensey of the Southern Californian Open. GMs Ildar Ibragimov and Joel Benjamin tied for first in the NY State Championship. However, since Ildar is from Connecticut and Joel from New Jersey, 16-year-old Teddy Coleman took the title of New York State Champion. He squeaked by fellow New Yorker WFM Irina Zenyuk on tiebreaks. Mark Kurtzman also earned 4.5/6, but he took three (!) half point byes in the last three rounds, and consequently had very poor tiebreaks. Organizer Bill Goichberg was excited about the turnout: "We had 197 entries (largest turnout since 2000), and players loved the upscale new site (Albany Marriott) and the wide variety of food options very close by, so we hope for well over 200 there next year." At the 70th Annual Virginia Closed State Championship, Andrew Samuelson took home the title with 5/6. Also in the spotlight were two deserving young ladies. Abby Marshall, current Polgar Invitational Champion beat two 2300+ players while Ettie Nikolova slayed two experts. With these outstanding results, both are due to break the 2000 rating barrier. Now we just need to announce a U.S. women's championship for players like these to prepare for! Abby Marshall (in blue) and Ettie Nikolova drew their game, and both tied for second place. Naturally, the Texas Labor day tournament held in Dallas, was filled with strong University of Texas at Dallas recruits. The winner this time was Drasko Boskovic. Born in Serbia and Montenegro, Drasko is currently majoring in business administration at UTD. 15-year-old Evan Ju(2254) beat out Emory Tate to take the New Jersey Open title. CLO columnist GM Joel Benjamin, who recently began coaching Evan said, "Evan is a dangerous attacking player." Watch out! On the East Coast, Labor Day signifies both back to school and colder weather. Can Californians appreciate the double punch? They did hit us up with two huge Labor Day tourneys, one in the L.A. area and one up North in San Fran. Recent CA transplant Josh Friedel and GM Alex Yermonlinsky won the Cal Chess Labor Day tournament. IM Josh Friedel and GM Alexander Yermolinsky tied for first in the CalState Championship in San Francisco. This year the SCO tried a new location in Temecula, half way between San Diego and Los Angeles in an attempt to draw players from both cities. It was hoped that a larger prize fund than normal, a fully guaranteed $25,000, would help boost attendance back to the levels of near 200 players, as we had a few years ago. Sadly for the organizers, it was not to be, and only 132 players took advantage of the extra prizes. Here are the figures for the last few years: 145 in 2005 (Los Angeles), 152 in 2004 (Burbank, which is north of Los Angeles), 126 in 2003 (San Diego, held just after the US Open in L.A., which hurt attendance), 192 in 2002 (Los Angeles) and 191 in 2001 (San Diego). It is hard to say with certainty what causes the variations in attendance, sometimes a new location hurts attendance just because it is not familiar to the players. In this case, the main culprit was probably the expensive hotel rooms ($200 a night) at the luxurious setting of the Pechanga Casino, a AAA 4 Diamond Resort. It was hoped that a casino environment might draw more players like the popular events in Las Vegas or Reno. But players are used to getting rooms for $100 or less in Las Vegas, Reno or at the LA Airport hotels. There were other cheaper hotel rooms nearby, but my guess is that some of the people who might have played took a pass due to the extra cost of the Pechanga rooms or the hassle of staying at a different hotel. Some people think tournament chess in general is on the decline because people can just play online now, but I don’t buy that one. There is nothing like the thrill of playing over the board at a big prestigious event. The surprise winner was IM Valentin Iotov, who recently moved to Los Angeles from Bulgaria. 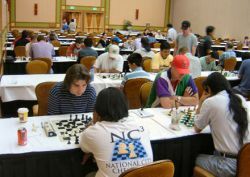 The teenage immigrant defeated talented young player, Joaquin Banawa in round 3. He then drew with the #1 rated player in California, GM Varuzhan Akobian in Round 4. In Round 5 he defeated the previous Southern Californian Open Champion, IM Enrico Sevillano. Iotov showed off the strength of the two bishops in this game, especially with targets like a5 and b7 to attack. 28.c6! was a nice touch. Both Grandmasters in the event, Varuzhan Akobian and also Melikset Khachiyan had a string of three draws in Rounds 3, 4 and 5 which kept them from placing first. Here's a nice win from Akobian, who was the guest of honor at the San Diego chess club a couple days before the event. By the last round no one could catch Valentine and with a quick draw in round 6 with another very young player, 16-year-old Joel Banawa, he won the trophy and a nice check for $3,000. Joel tied for second with Akobian, Sevillano and Khachiyan.For a full wall chart, go to westernchess.com or to the USCF MSA. The players had a fabulous time. The setting was ideal, with a very large, well lit room, which was very quiet and isolated from the noise of the casino. Ice water in real glasses was continuously supplied by respectful waiters and the bathrooms were always clean and well maintained. A variety of restaurants were available, along with a spacious food court. Parking was plentiful and free. Pechanga is the largest casino in California and several people told me they won large amounts of money at the tables and/or slots. Of course gamblers never tell you when they lose! along with more pictures and games. I hope that the word will spread to those that didn’t attend so that the next time we hold an event in Temecula, even more people will participate. Spending the entire Labor Day weekend playing chess may seem a bit extravagant or even a bit kooky, but to me I can’t think of a more fun thing to do than to play chess with my friends for big prizes, glory and bragging rights. P.S. Jorge bombed out in the much tougher Open Section, but I won $700 for a 2nd Place tie in the Amateur Section. I am a bit of a sandbagger, but, hey, so is everyone else in these big events! Florida State Champs- Gildardo J.Garcia. GM Julio Becerra takes title as top Florida player. No draws in USCL opening week How Fast is Too Fast? Bradford is the 2006 Senior Open ChampJennifer opens reader mail Busy chess week in TennesseeTen Things you don't want to hear after losingMortal Knights GM Joel on a strange Sicilian Labor Day RecapBack to School special: Dr. Root interview Emory AnnoTATES Jennifer Blogs about Knights victoryIrina Blogs from Israel: Part I. Kramnik leading 2.5-.5 Tell your opponent or watch it go down? Knights first to nick SluggersWhat Game Five?